Steve Dawson was born in California, raised in Idaho, and currently lives in Chicago. His songs show evidence of all 3 places – the California folk-rock of the early 70’s (Gram Parsons, Neil Young, Jackson Browne), the country music he heard growing up in Idaho, and the blues and soul music of Chicago. Dawson first picked up guitar at age 12 and began writing songs almost immediately. His first professional gig was playing guitar with Cadillac Carl and the Road Rangers at the Silver Dollar Saloon in Bellevue, Idaho. After high school, Dawson attended the Berklee College of Music in Boston, studying jazz composition and songwriting, while also performing in the local folk music scene. In the early 90’s Dawson moved to Chicago. Upon his arrival he met Diane Christiansen and they formed the band Stump the Host, which became a training ground and a showcase for Dawson’s eclectic songwriting. 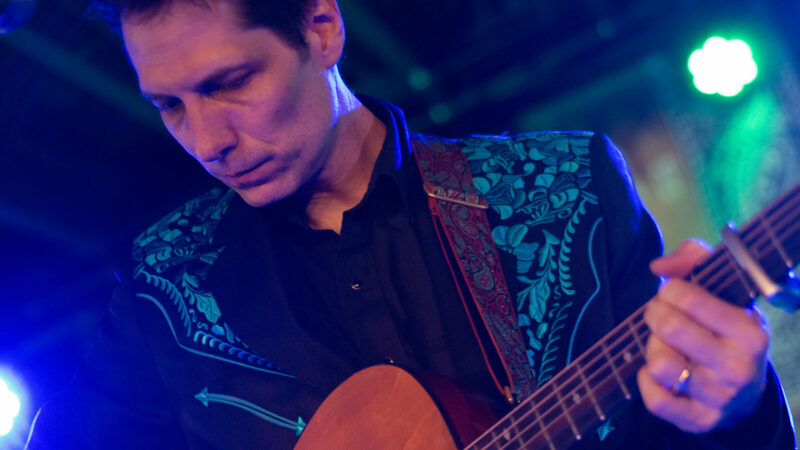 In 1995 Stump The Host changed personal and evolved into a new band, Dolly Varden, releasing the first of five albums that would reflect the growing craft and depth of his songs. Critics from Rolling Stone, Uncut, and the Village Voice, among many others, have praised Dawson’s gift for melodic, evocative songwriting. Dolly Varden has toured all across the US and Europe over the last 18 years. In 2006 Undertow records released Dawson’s first solo album, “Sweet Is The Anchor,” a collection of quiet, layered songs recorded in Steve’s home studio. Critics noted Dawson’s heightened strength as both a songwriter and singer, combining elements of country and soul: “Sweet Is The Anchor is a vocalist’s album awash in the languor of country music and the Saturday night highs of soul” (Chicago Daily Herald). Dawson’s second solo album, “I Will Miss The Trumpets And The Drums,” (Undertow, 2010), was once again self-produced and recorded in Dawson’s home studio, Kernel Sound Emporium. The follow up to “Sweet Is the Anchor,” the album features 13 haunting, melodic songs about change and letting go, sung in Dawson’s plaintive tenor, with echos of classic country, pop and soul. For his third solo album Dawson joined forces with some of Chicago’s most inventive and acclaimed jazz musicians to create the improbable Funeral Bonsai Wedding. The group features three of the most revered musicians in the improvisational jazz world: Jason Adasiewicz on vibraphone, Frank Rosaly on drums, and Jason Roebke on bass, along with Dawson on guitar and vocals, and Robbie Fulks and Dolly Varden’s Diane Christiansen singing harmonies. According to Dawson, “The new songs I’ve written were inspired by Bob Dylan, especially the long songs, Van Morrison’s Astral Weeks, mid 70’s Neil Young, Leonard Cohen, and the mix of folk and soul music that I’ve always loved. Working with these jazz musicians is a little bit like floating. That’s the best way I can describe it. Writing and arranging this album with them has been unlike anything I’ve ever done.” Chicago may be one of the few places in the country were a meeting of such divergent musical styles could not only come together, but coalesce into such an impressionistic, sublime sound. Dawson met Rosaly and Adasiewicz in the early 2000’s when they were all working at Chicago’s Jazz Record Mart. Later Roebke was introduced to Dawson by Adasiewicz and over the years they’ve all played together in different configurations and spaces. It wasn’t until Dawson had this batch of songs together that he felt he had the music for them to finally come together and record as a group. The album was recorded live in the studio to best capture the improvisational nature of the musicians. Only the harmony vocals were overdubbed. In addition to performing and recording Dawson teaches songwriting and guitar at the world famous Old Town School of Folk Music in Chicago.